I would like to share some of my favorite Catholic paintings, and I invite you to do so as well. Pasquale Sarullo, Our Lady of Good Counsel (19th century). This painting is based on a miraculous 15th century fresco of Our Lady of Good Counsel from Genazzano, Italy. I love especially the deep, intelligent and loving look of Child Jesus at His Mother, as well as serenity and holiness of Our Lady's expression. Pasquale Sarullo was a Franciscan friar and a talented artist. 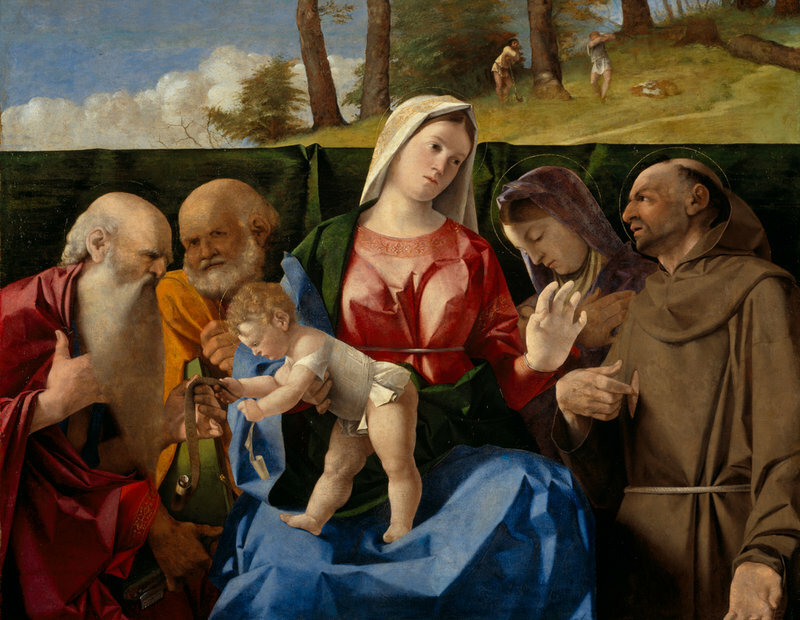 Lorenzo Lotto, The Virgin and Child with Saints Jerome, Peter, Francis and an Unidentified Female Saint (c. 1505). A beautiful painting with easily recognizable Saints - first to the left in St. Peter who holds a key to Heaven, second is St. Jerome who holds a large book (clear reference to his Latin Vulgate), St. Francis can be recognized by his clothing. It is a pity we don't know who the female Saint is. Matthias Grünewald, The Crucifixion from Isenheim Altarpiece (1506-1515). I was fascinated by Grünewald in my childhood, although back then for artistic rather than Catholic reasons. His paintings of crucifixtion (see also The Small Curcifixtion from 1510) emphasize cruelty and suffering of Our Lord's Passion. Nicolas Poussin, Seven Sacraments: Confirmation (1645). This painting is part of second series of Seven Sacraments by Poussin. What is interesting about it is that Poussin tried to maintain as much of historical accuracy (at least within the knowlege about antiquity available back then) as he could. 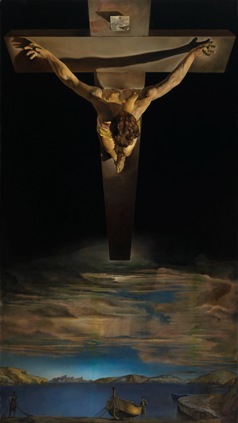 Salvador Dali, Christ of St. John of the Cross (1951). Personally I love Salvador Dali's art, despite him being a controversial figure - he was a surrealist (at least in style of painting, his formal association with surrealist groups, which sadly were often very anti-Catholic, was short), but he eventually became Catholic in the 1940s, despite his atheist background. He even had an audience with Pope Pius XII who blessed his painting The Madonna of Port Lligat. The hands of the painting by Gruenwald also bother me. Its almost as if it draws more attention to the awkward position than to the reality of the Passion. I like many of El Greco's paintings. I have a book with many of them which belongs to my brother. I obviously chose another of El Greco's paintings to be my avatar.